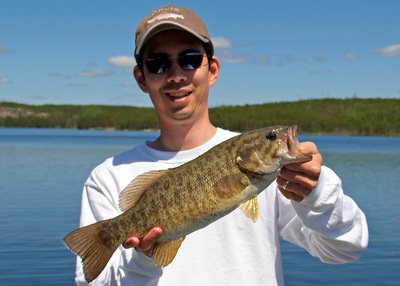 Smallmouth bass are slightly less widespread than their cousins, the Largemouth Bass. I have caught a few hundred of them in various places but I don't feel I know nearly as much about them as the Largemouth. They tend to frequent colder waters than the Largemouth although in many places the same lake will hold both species. Smallmouth also tend to spawn and generally hang out in deeper water, so perhaps that makes them feel less familiar than the Largemouth. 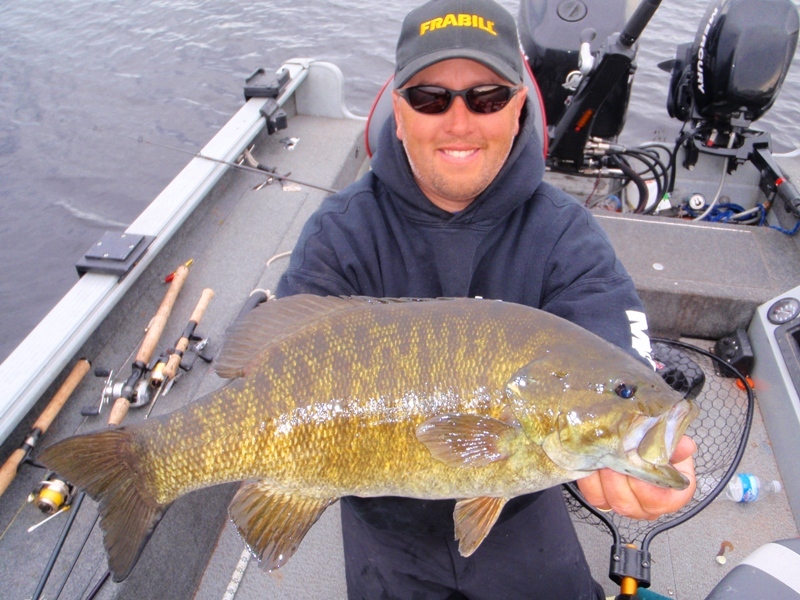 They tend to hit many of the same lures although often you will have more success if you downsize a bit. 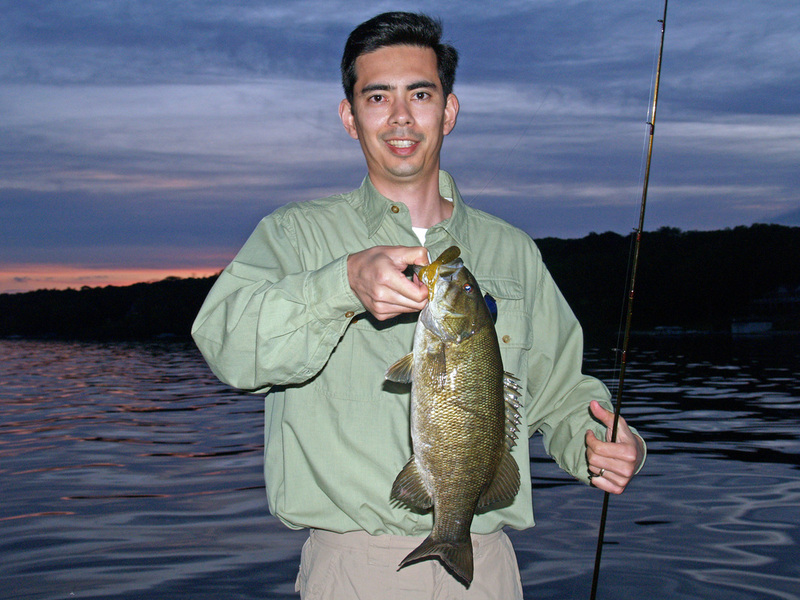 Smallmouth Bass do not attain the same large potential size as the Largemouth. A 5lber is a very big one and they top out around twice that. 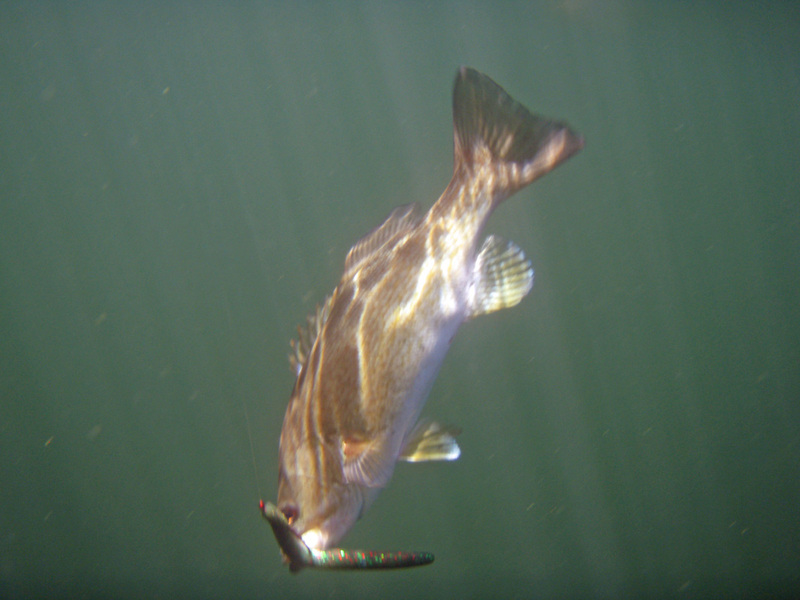 They are scrappier than Largemouth pound for pound and their fight is usually noticeably better. I have never eaten one, so I don't know how they taste. I always release them. 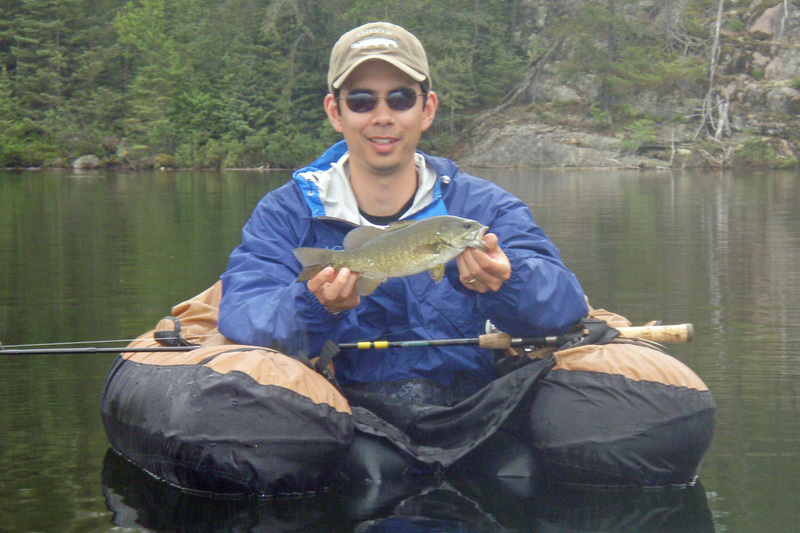 I have never fished for Smallmouth with anything heavier than a light spinning rod and 6lb test line. A Daiwa Certate spinning reel is an excellent choice for these but you don't need anything really fancy. See below for tackle recommendations. 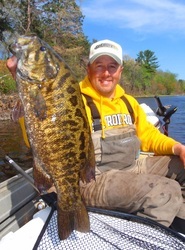 Smallmouth hit both bait and lures. They are often found near weed edges or sunken timber. Beaver houses are a good bet if they are present. The number one lure for me has been the Senko. 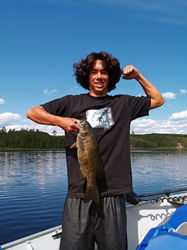 See the Largemouth Bass section for a description of how to fish it. Colors that have worked for me include Green Pumpkin and Watermellon. 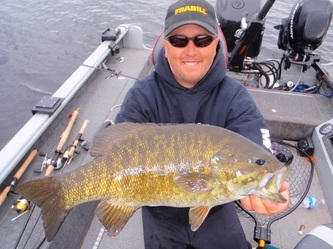 I like the 4" version for Smallmouth. I pair it with a Gamakatsu EWG 2/0 hook (see below). 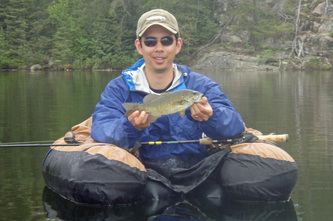 Small jigs with a Gulp Craw or similar crayfish imitation trailer work well in many places. The Bitsy Bug is a great jig in natural crayfish colors. I have also had some success fishing tube jigs in Green Pumpkin or Watermellon. I like the Strike King Kevin Van Dam Pro Tube but many tubes will work. I like to cast these out and let them sink slowly, occasionally twitching on the way down. Most bites happen on the sink so you have to pay a lot of attention to how your jig is falling. If something stops it, reel in the slack and set the hook. If it sinks and you get no hits then twitch it while reeling a foot or two and then let it drop and repeat all the way to the boat. Another common lure for Smallmouth is a crayfish imitation crankbait such as the Rebel Craw but I have not really fished those much. When they are hitting topwaters (typically early morning and in the evening) the Heddon Baby Torpedo can be good. ​See below for what some of these lures look like and click the links to purchase. 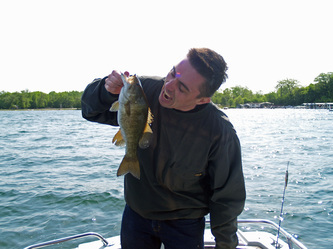 Minnows and leeches are supposed to be good baits, but I have not fished for Smallmouth much with baits. Crayfish work well, especially smaller and medium size ones. The two biggest Smallmouth ever caught were in Dale Hollow, Tennessee so that seems like a good place to try. For numbers there are many lakes in Ontario, Canada that have tons of small to medium size ones.